At last the boy's blankie is on his bed! He is very happy and it is dragged downstairs in the morning for snuggling on the couch. 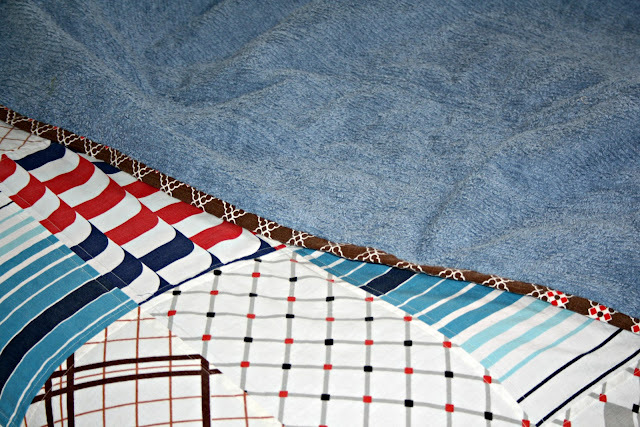 Made entirely with thrifted fabrics, sheeting on the front and a chenille bedspread for the back. I haven't used any batting. The chenille makes it surprisely warm and it makes for a lovely soft, snuggly blankie. Linking up with My Creative Space. O wow it looks awesome!!! And a gorgeous new bed too! It looks fantastic! 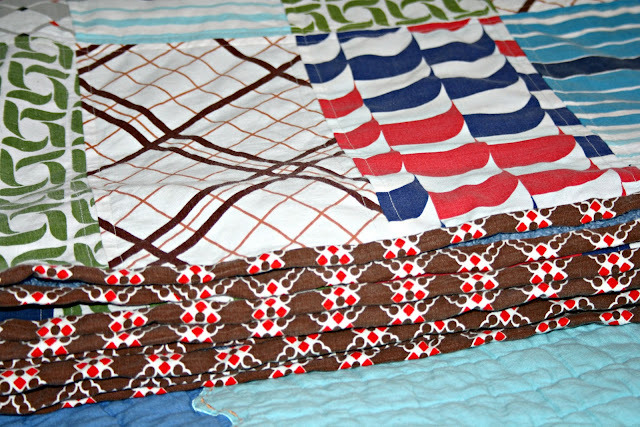 I love the mix of fabrics, and even though it uses vintage fabrics, it looks quite modern - love it! Love it! Well done! Such a great boys quilt. what a gorgeous quilt for a boy..it looks very snuggly.. I love the boyish'ness of it!! and it looks so fabulous with his collection of cushions and pillows. I love the idea of chenille backing, I've been meaning to do that for a while! looks great Lea Lea, you can get your floral one back now. I love the pops of red in it. well done. Love the mixture of patterns. I am not going to pass up the next chenille bedspread I see at the oppie either - what a great idea! That's gorgeous! I love that you trifled all the fabrics, makes it even more special. Oh wow! It looks fantastic! 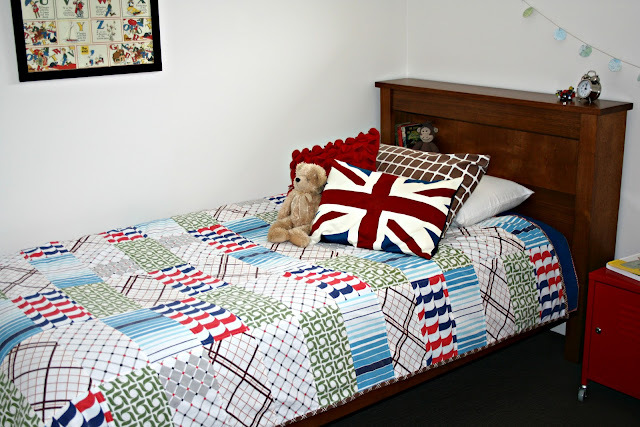 I often find boy style vintage sheets when I'm out thrifting, this idea is great!